It’s decidedly not The Donald’s wall. 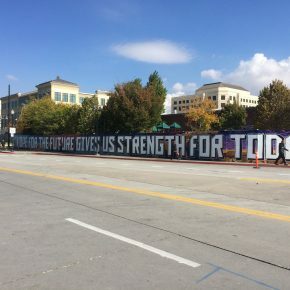 This one was installed by 100 volunteers and painted by, among others, paid graffiti artists and Salt Lake Tribune editorial cartoonist Pat Bagley. It’s quite a project, quite a story, and more is to come. 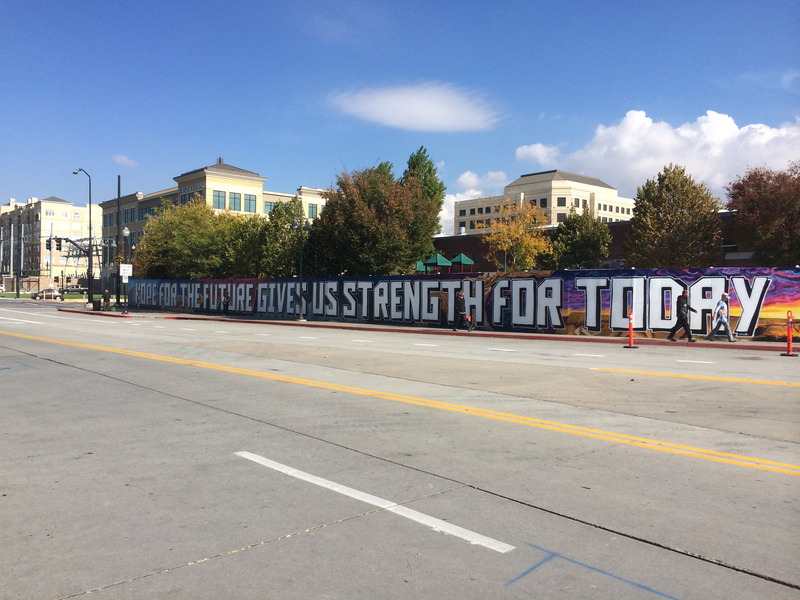 Surrounding a newly improved children’s playground at The Road Home on 500 West and 200 South, one inspirational piece of the wall, running down the block, reads: HOPE FOR THE FUTURE GIVES US STRENGTH FOR TODAY. 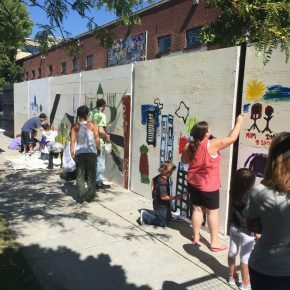 A partnership between Salt Lake City and The Road Home (with the city funding the majority of the project), the wall was proposed by Ashley Hoopes, who volunteers at The Road Home and started a preschool for the children living there. Hoopes noticed that when she took her charges outside to the playground, none of the shelter families was using the area. “The chain link fence allowed their kids to witness drug deals and crime. It made it easy for dealers to sneak drugs in. I used to have to walk the area before class each morning, to pick up used drug paraphernalia that had been tossed through the fence,” Hoopes says. Ellis Dean Hovey, a homeless man she had gotten to know over the years, said that a solid wall ought to be built to protect the children. 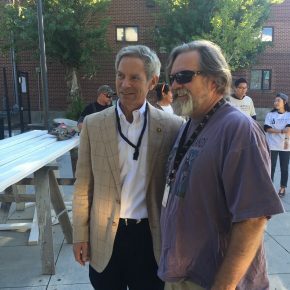 Her good friend, Salt Lake City artist Chris Peterson, director of the Sorensen Unity Center (he did the train on the wall), thought parents and children at The Road Home should create a mural, along with local artists, to cover the blank cement, and the pair proposed the project to the mayor’s office. 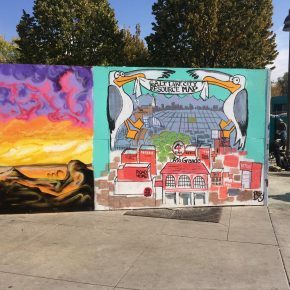 Elizabeth Buehler, the city’s homeless services coordinator, says Public Services gave the materials and made improvements to the playground and “we hired graffiti artists to do the artwork.” There is another sign in process around the corner with a floral motif. “Each flower will be done by a member of the community at some point in the near future,” says Buehler, probably in a couple of weeks. 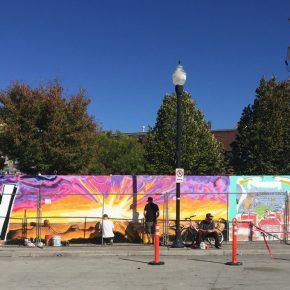 Armed with a grant from Art Access, Hoopes and Peterson held Sunday art classes to help parents, teens and children express themselves through paint on the mural. They want to paint the inside as part of an art therapy wall, says Peterson. 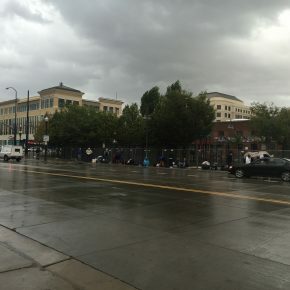 “This has been a huge project because of what it was meant to do, which was to provide a sanctuary for people [at the shelter] and a buffer between them and the street. People there are very appreciative for brightening up their space on the outside and, when you go on the inside, the space feels so much safer,” he observes.